Warm weather calls for cool, refreshing treats. 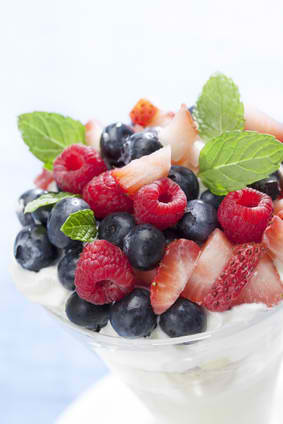 This tasty parfait combines the naturally sweetness of fresh, seasonal berries with the creamy goodness of Mascarpone cheese. Did You Know? Mascarpone cheese (most commonly found in Tiramisu, a classic Italian dessert) is a fresh, extremely rich cow’s milk cheese found in both sweet and savory dishes. In a bowl mix the strawberries, raspberries, blackberries, blueberries and liqueur together. Cover and refrigerate for half an hour. In another bowl, combine the Mascarpone cheese, cream, sugar and vanilla. Beat, using an electric mixer, at high speed. Refrigerate 30 minutes. To serve, alternate the fresh berries and cheese mixtures (ending with the cheese mixture) in 6 parfait glasses. Top with grated or shaved chocolate pieces and/or top with sprigs of fresh mint.